String Project of the Year! We are excited to announce national recognition as the String Project of the Year! The National String Project Consortium and the American String Teachers Association have recognized the excellence of this program. Congratulations to all our teachers, and thank you to our families for your continued support! Happy summer, String Project family! If you have a child who was in our program last year, you should have received an email with 2018-2019 registration instructions. Please note that registration forms are due by July 1. Private lessons will begin on Tuesday, September 4 and our Saturday classes will begin on September 8. I hope you’re well! A few reminders are below. New and returning families that are part of our full time instrumental program and need an instrument are welcome to stop by the Instrument Room on Saturday, August 26th from 9am to noon forinstrument sizing. The Instrument Room is on the first floor of the UT Butler School of Music in Music Building East. There will be signs directing you to the Instrument Room from the main lobby. If we do not have the size you need, we can direct you to local stores. Please note: we only rent violins, violas, cellos and basses. We do not carry guitars in our inventory. Private lessons begin on September 5th. Teachers will have their studio lists by the end of the week. You can expect emails regarding lesson scheduling beginning this weekend. Our first String Project Saturday will be on Saturday, September 9th. A detailed message about this day will be sent later in the month. Please let me know if you have any questions. I look forward to seeing you all soon! 1. Private lessons begin on September 5th. You will be receiving emails from your teachers soon, so keep an eye out! 2. Our first String Project Saturday will be on Saturday, September 9th. I will send a detailed message about that later in the month. 3. Instrument sizing will be on Saturday, August 26th between 9am and noon in the instrument room in MBE (Music Building East). If you are unavailable, our Instrument Steward will be available on September 9th as well. Please note: we only rent violins, violas, cellos and basses. We do not carry guitars in our inventory. We will be sending an email about guitars shortly. Thank you! We look forward to seeing you all soon! Jury results and copies of jury sheets with teacher comments will go out in the middle of May. I and the other teachers thoroughly enjoyed hearing the students play! If for some reason you missed or were not able to signup for a jury and need to schedule a make-up jury in August, please let me know. Students should dress for a special occasion. If performing in an orchestra, students should wear a white top and black bottom. I have attached the schedule for this Saturday. It is quite a bit different from most weeks, so please continue reading so you know exactly where your children need to be and when they need to be there. At 8:20, all Orchestra students and Guitar students should arrive for tuning and warm-up in their assigned rooms. At 8:45, ECE students (both 9:00 and 11:00) should report to Bates Recital Hall in your designated section in the audience. If you have strollers etc. that you wish to store somewhere, 2.604 will be available for that. However, the room will not be supervised or locked, so please keep valuables with you. At 9:00, the Orchestra Concert begins. Teachers will have ushered orchestra/guitar students to the hall by this time. We heavily encourage all students in Cadets, Pre-ensembles, and Beginning Ensembles to make it to this concert to see their upper level peers perform. It not only contributes to the family spirit of String Project, but also serves as a motivating look into the future so students get an idea of what to look forward to when advancing to the orchestra level. At 10:00, the Orchestra Concert will have ended. ORCHESTRA STUDENTS and SCHOOL-AGED ENSEMBLE STUDENTS report to their 10:00 rooms DESIGNATED BY THEIR MOST ADVANCED PLAY-DOWN PIECE (orchestra students grab their belongings from their previous room first). CADETS and STEPPING STONES arrive and report to their own unpacking/warm-up/tuning rooms. See schedule for assignment. At 10:30, the Playdown “Gala” Concert begins. Teachers will have ushered students to their designated spots, including placing cellos and basses where they need to go. The cello/viola playdown will happen first, followed by the violin/bass playdown. Teachers will facilitate the transition between these two playdowns. Please keep in mind that students and parents should stay and watch the entirety of the concert, even if they are finished performing for the day. The concerts should be over by 12:00pm, which marks the end of the Saturday. The Saturday following the Spring Concert will feature performances from our Electives classes (Recording Technology and Fiddle) as well as from our Parent Ensembles. Performers will arrive at 9:00am for warm-up, and the concert will take place between 10:00-11:00am. This day will also be used for instrument sizing between 9:00-10:00am; if your child is due for switching instruments, the instrument room will be open and several teachers will be there to facilitate this process. That’s it- I want to thank everyone for their hard work this past year. It has been a wonderful experience serving as Assistant Director this year, and I have derived GREAT pleasure in interacting with and getting to know each and every one of the students and parents alike. I am looking forward to a lovely concert on Saturday to close out the season! 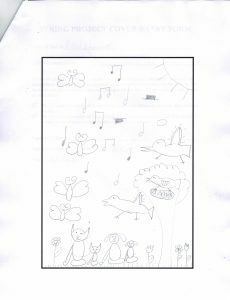 Thank you to those students who submitted art for the cover page of our Winter Concert Program! I have attached the Saturday schedule. This Saturday is a football home game with an 11am start time. This will make parking extremely difficult. We recommend getting dropped off, carpooling, and arriving very early! This Saturday we will be having our dress rehearsal. Classes will be making their way down to Bates Recital Hall (guided by their teachers) for a run through of their pieces for the Winter Concert periodically throughout the 9:00 and 10:00 hour. Stepping Stones: please report to Bates Recital Hall at 9am and then after their dress rehearsal is over the class will return to their normal classroom. The jury sign-up bulletin will be available in the main lobby once more this Saturday. As a reminder, ALL full-time students playing an instrument (except for cadets) are required to sign up for a non-promotional jury, unless they are attempting to promote. Students will be asked to demonstrate what they have been working on this past semester. Failure to sign up for a jury will result in probation in the next semester. Saturday-only students should only sign up for a jury if they are attempting to promote to the next ensemble. Cadets and non-instrumental students do not sign up for juries. Next Saturday, 11/19, is the last day for both Honors Recital recordings and our Cover Contest submissions. I have attached a copy of the Honors Recital form, and will have copies at the main table this Saturday. 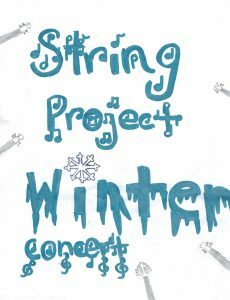 For the winter concert, we are holding a Cover Contest: String Project is accepting submissions of original drawings to be placed on the cover of the programs for the winter concert. 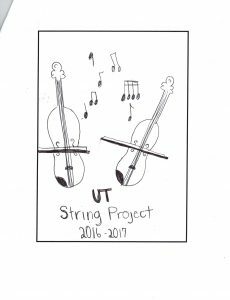 All current String Project students are eligible to enter, and there is no limit to how many drawings a student can submit! Please adhere to the guidelines in the attached document; there will be copies of this document at the main table. The deadline for submissions will be Saturday, November 19th. At our teacher meeting today, we talked about student tardiness to Saturday classes. Please ensure that you arrive at least ten minutes prior to class start time. It has been difficult for teachers to stop classes in order to tune students arriving late. Lastly, a reminder that next week, the week of 11/14, is the last week for private lessons. In addition, String Project is on break from Saturday class on 11/26 for Thanksgiving break. Thank you, please let me know what questions you may have. Congratulations to all the students for a wonderful and successful Eclectic Styles Festival last Saturday! I hope everybody found the day enjoyable and eventful, as I sure did! The students’ performances were remarkable; all of the practice they have been doing has truly paid off. Now that we are finished with the Eclectic Styles Festival, we will be moving full speed ahead to our Winter Concert, one Saturday at a time. This Saturday’s schedule has been attached. It is also a UT Home football game this Saturday, with a kickoff at 2:30pm. As it is an earlier kickoff, there will be a lot of congestion on the streets. Please keep in mind that those with parking permits will still not be allowed to park on campus. I would recommend arriving early, carpooling, or getting dropped off, if possible! 1) The last week of private lessons will be the week of November 14th. This means that students will only be having 2 or 3 more lessons for the rest of the semester. If for some reason you missed a lesson earlier this semester, you may try to arrange a make-up lesson on the week of Thanksgiving, given that your teacher is available. String Project will also be on break for November 26th due to Thanksgiving break. A full-time student in the instrumental program (EXCEPT FOR CADETS). Students planning to play a promotional jury must have written approval from their private teacher (in the form of a signed copy of the Posture/Position Checklist), and be fully prepared to complete all the requirements for their target promotion according to the Promotional Guidelines. 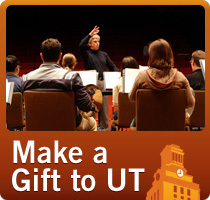 The Posture/Position Checklist and the Promotional Guidelines can be found under “Student Resources”, “Document and Forms” on our website: stringproject.music.utexas.edu. The sign-up sheets for jury times will be available starting NEXT week, November 5th. The sign-up sheets will be posted on Saturday 11/5 and 11/12. 3) The due date for Honors Recital tapes is November 19th. The Honors Recital is a chance for students of all levels to perform for the entire String Project family during our Spring Convocation next semester, accompanied by a professional pianist. String Project faculty will evaluate all videos submitted and select 10 participants based off of their ability to demonstrate excellent fundamentals, such as tone, intonation, rhythm, and musicality. If you are interested in submitting a video, please consult your teacher and the Honors Recital Form (which can be found in your convocation folder that you received at the beginning of the year). If you need an additional copy of the form, please email the String Project email and I will send one over to you. 4) One calendar clarification: The Dress Rehearsal for the Winter Concert will take place on 11/12. We decided to move it from 11/19 due to Region Orchestra. Lastly, I would like to share with you part of a discussion about the consistency of student progress. It became obvious in this discussion with the teachers that the students who are making the most consistent progress are the ones that are listening daily to their Suzuki recordings. Please ensure that your children are listening every day. That’s all for this week. More details for the above topics will be sent out as the dates come closer. I hope everybody has a wonderful rest of the week! Thank you to those who attended and participated in our first buddy meeting of the semester! You will find pictures in the attached Buddy Bulletin below. Please mark your calendars on April 16th from 12:00 – 12:45 for our end-of-year Buddy Recital. Each buddy pair will perform a piece of their choosing on the program. If you need help brainstorming or organizing a piece for the program, please let me know! Be on the lookout for upcoming Enrichment Events! As always, feel free to reach out with any questions or concerns. Attached you will find this Saturday’s schedule. I have also attached a revised and current version of our Promotional Guidelines. Please be sure to use the most current edition of our Promotional Guidelines if your child is preparing for a promotional jury! We are always improving our guidelines to serve the needs of the program and the ensembles/orchestras within it. Starting this semester, I am excited to announce that the Intermediate Orchestra has been invited to perform at The Thinkery! As this is a recent development, it isn’t on the SP Calendar, but they will be playing there on April 18th, the same day that the Advanced Orchestra will play at the Bob Bullock Museum. These run-out concerts are very important to the world of music in general, not only because they give our students more performance opportunities, but also because they are a form of outreach. Through outreach, we are able to spread the love for music making to the general public, whose lives music may not play such an important role. If we take the initiative to expose the world around us to the beauty of music, they may think to come to a concert hall and witness the artistic craft that all musicians invest so much time to hone and develop, and even consider investing more of their own time in similar endeavors. That’s all I have to say for this week- I am looking forward to seeing you all Saturday!